and we can help brew up big returns for yours. do good. drink good. feel good. a small investment with naturally big returns. When it comes to great coffee, it’s good to be picky. Our coffee is 100% certified, ensuring that farms and co-ops meet rigorous standards for protecting the earth, supporting their communities, and improving workers’ livelihoods. Buying coffee beans from Rainforest Alliance, Fair Trade and Organic Certified farms ensures that the lands, waterways, and wildlife habitats are protected. Workers on these farms are paid fairly, enjoy housing, and have access to medical care and schools for their children. Once the green coffee beans reach our roastery, this is where the magic begins. We slow roast our coffee in Italian bricklined roasters, allowing the radiant heat to lock in flavor and aroma. We then use air to cool our beans, making sure to never douse with water. This air cooling process may take longer, but it’s key to preserving freshness and creating the smoothest flavor possible. We’ve been sourcing, roasting, and serving our hand crafted coffee for over 30 years. 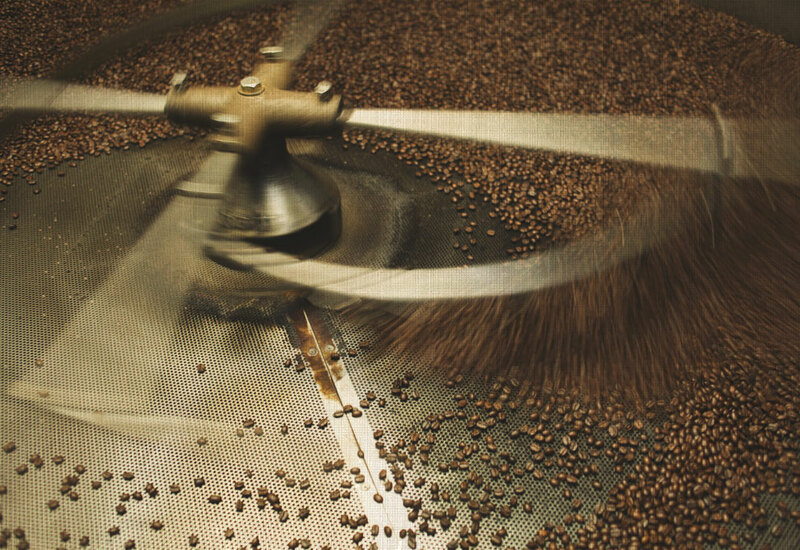 Our distinct roasting style, experience, and heritage defines who we are. It inspires our amazing coffee and secures our signature smoothness. Whether you want to know about where coffee comes from, how it’s roasted, or why our coffee is so smooth, you can count on Java City to know the answer. Our commitment to quality and excellence is a result of our passion and curiosity for coffee. We travel the globe and support World Coffee Research in seeking the best coffees of today and the future. As founding members of the Specialty Coffee Association and the Roaster’s Guild, Java City shares our learning and leads the coffee industry in knowledge. Visit our roasting facility during Open House days or check out our blog for cool coffee news. Coffee is our business. With over thirty years as a roaster and retailer of specialty coffee, our expertise is your competitive advantage. When you open a licensed Java City, our certified trainers are on site to ensure your team can produce the excellent coffee and inviting atmosphere we’re known for. Our partnership continues with regularly scheduled consultations. Our support team will visit your location and provide feedback to improve your quality and sales. Since we never charge a licensing fee, we are invested in helping you sell as much coffee as possible. We take pride in delivering the smoothest coffee to our wholesale partners and want to ensure you are well equipped to keep our coffee tasting great for your customers. That’s why we have a comprehensive equipment program. We work closely with coffee brewer and espresso machine manufacturers to create brewing and extraction profiles perfectly matched to our coffees. Our partnerships give you access to our expert recommendations, competitive pricing, and for select situations, a loaned equipment and maintenance program. Call us to discuss your needs. Our trade dress focuses on Java City’s commitment to responsible sourcing, a hand crafted cafe experience, and the rich heritage and unique roasting principles that define our smooth coffee. 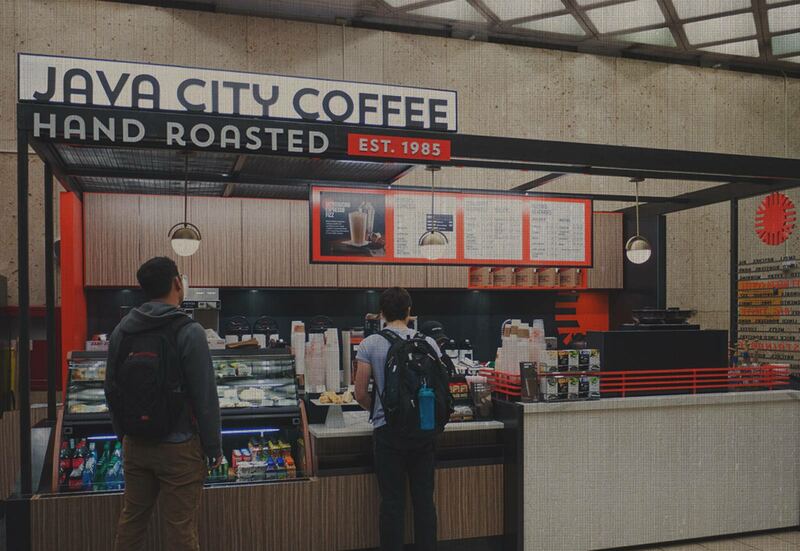 The Java City brand is best used in locations seeking to promote the art and craft of great coffee. Whether you need coffee for catering, a self-serve environment, or branded cafe for your customers’ daily rituals, we designed a handsome solution. In addition to 100% certified sustainable, hand roasted coffee, our program offers Fair Trade and Organic tea, Rainforest Alliance certified cocoa, and a comprehensive menu developed with clean ingredients in mind. 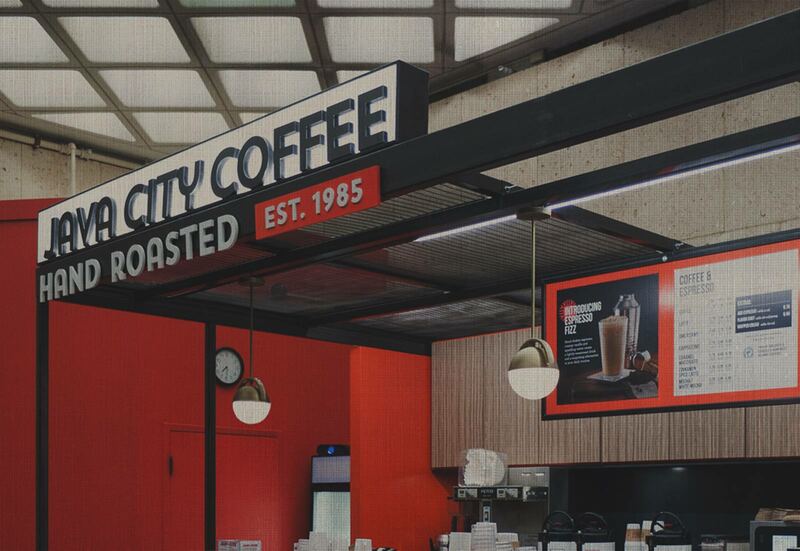 Java City offers a number of profitable turnkey programs designed specifically for retail, foodservice and hospitality industries. Our coffee and espresso programs are currently featured in over 2,500 wholesale outlets nationwide. We provide high quality products and unparalleled program support, all without royalty or licensing fees. You’ll come to know Java City as your one-stop dependable coffee partner. 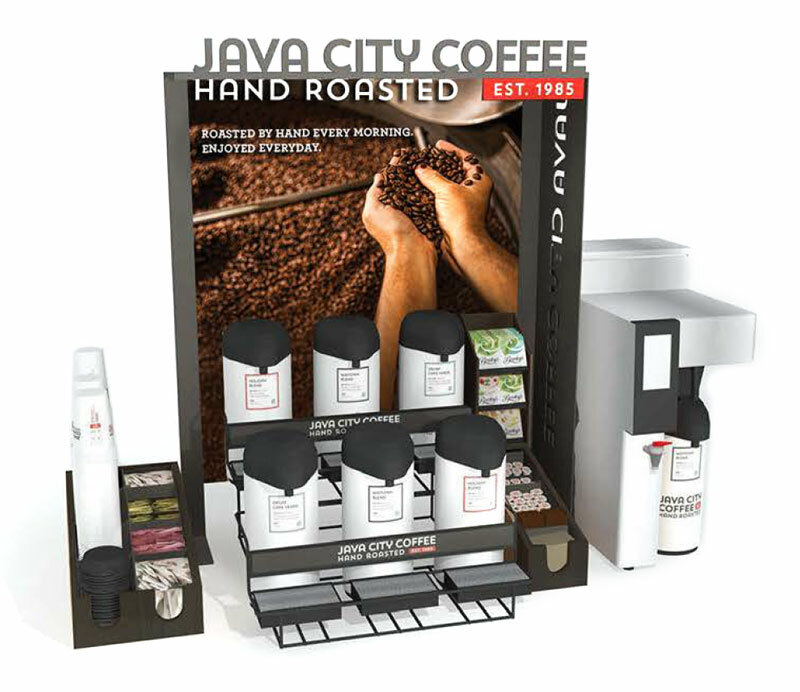 Java City offers a number of sizes and product lines designed specifically for retail, foodservice and hospitality industries with limited space. We provide high quality products in easy to maintain, self conatained set ups, all without royalty or licensing fees. 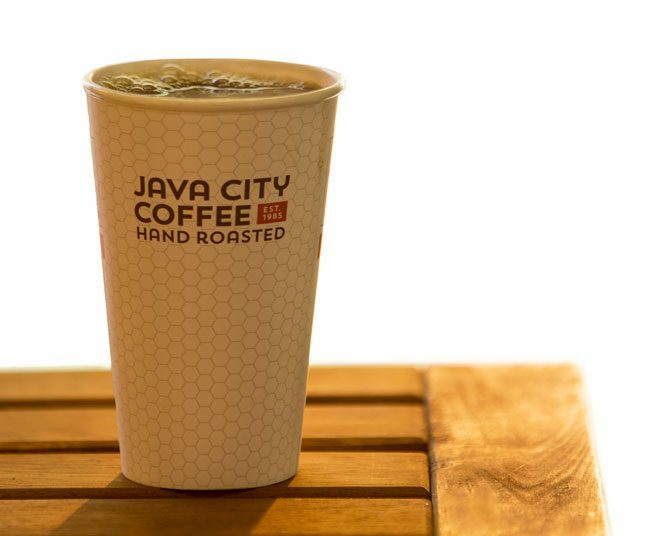 Java City is your easy going coffee bar partner. For more information on serving Java City at your location please contact a sales associate today.